Home What Is "Sick Building Syndrome"? What Is "Sick Building Syndrome"? In the early 1970’s “sick building syndrome” (SBS) was coined to describe “unexplained” illness among occupants of certain new office buildings. Occupants complained of inflamed mucous membranes, respiratory problems, fatigue, headaches, and neurocognitive changes. Basically, when they went to work in these newly constructed office buildings their noses began to run, their throats got sore, they felt tired, headachy, had difficulty breathing, and sometimes even lost concentration and attentiveness. However, whenever they left the building their symptoms started improving. Something in the building was making these people feel “sick.” This illness came to be called “building related illness (BRI). The “Indoor Environmental Quality (IEQ)” as the name implies refers to the quality of the air inside a building. In the early days Indoor Environmental Professionals mostly concentrated their efforts on chemical emissions or Volatile Organic Compound (VOC) emissions from paints, adhesives, carpeting and other flooring materials, and other assorted building materials. However, even when these items were addressed or their “offgassing” of VOC emissions had subsided, the BRI remained. It was obvious that something else was factoring in to cause Sick Building Syndrome. Although biological contaminants have been given little attention until relatively recently, substantial proportion of building-related illness (BRI) and sick building syndrome (SBS)…is the result of exposure to such contaminants… There is abundant evidence from investigations in several countries that symptoms of eye, nose, and throat irritation as well as cough and tiredness and fatigue are present in excess among persons or populations in certain buildings. 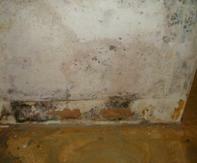 Although several agents have been suggested as causative, the most extensive evidence is found for dampness and mold. So what does this all mean? If you have moisture in your building/home you have reason for serious concern. Basically, moisture is vital to the growth of mold. If you have/had a roof leak, pipe leaking, flooding, HVAC troubles or otherwise high indoor humidity (above 50%) you have conditions, which can promote mold growth. These sources of moisture must be found and fixed. The materials they have affected must be moisture measured, inspected, and if moldy, remediated. 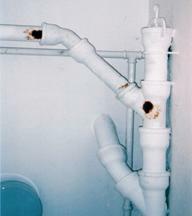 Musty, “mildewy”, moldy, funky … there are many words to describe it, but it all means the same thing, you have mold. These are technically called MVOC-s (microbial volatile organic compounds). It’s the odor given off by active mold growth. We say growth because you are actually smel-ling the “gas” given off by microbial digestion. Yes, we all do it and mold is no different. Some will try to say that these secondary metabolites are toxic to humans. However, this has not been proven. What we do know is that too much of anything is not good. 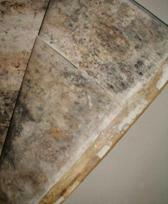 If you smell mold it means it is there and it is growing, and it should be taken care of. When a preliminary determination indicates that mold contamination (as defined in S520) exists or is likely to exist, it is highly recommended that an assessment (as defined in S520) be performed prior to starting remediation. It is highly recommended that an independent IEP with no business affiliation to the remediator be used for this purpose. It is important that you have an unbiased and knowledgeable person(s) assessing the condition of your home/building. Mold must be handled carefully and under a very specific protocol of procedures and engineering controls to protect the health of occupants and prevent the spread of contamination to previously unaffected areas. At Oasis Indoor Environmental we are dedicated to serving you as the occupant of the home/building. We are mold and moisture specialists. We are Indoor Environmental Professionals. We understand mold, how it grows, how it gets into the air, and how to clean it up. We will use occupant interviews, visual/olfactory inspection, moisture readings (ambient and building materials), and site-specific sampling strategies to assess if and to what extent mold, allergens, or other environmental stressors are compromising your environment. We perform a comprehensive assessment, assume nothing, and personally care about you and your health. In the end you will receive a report explaining not only results of our assessment and interpretation of any applicable lab evidence, but also a written protocol outlining how to mitigate or remediate the problem. We will work with your mold remediation contractor to monitor the job and provide the 3rd party clearance that it was done right and to completion. Most of all, we are there for you. If you have any questions or concerns we are happy to talk with you. If you need us to explain your building’s condition to other concerned parties we are qualified and happy to do so. I hope that this article has helped answer some of your questions and provided you some direction in how to handle your indoor environmental quality issues. Please call us with any questions you may have. We look forward to serving you and serving to improve the health of your building. – President Oasis Indoor Environmental Inc.